When she uses her net-zero propulsion system, Dragonfly is kind of an honorary sailboat. So we're really enjoying our stay at the town dock in Oriental, self-described "sailing capital of North Carolina." What's the town like? Here's a telling statistic: according to Towndock.net, the popular local news source, Oriental is home port to 2,700 boats--which works out to "more than three boats per resident." There's a nautical consignment shop, where you can pick up bits of teak and brass, cheap. Cap rambled home with some chain for the new anchor wrapped around his shoulders, much to the amusement of passersby. The town dock sits squarely in front of the town coffeeshop, making it easy for residents to scope visiting boats. We hear British narrowboat captain Terry Darlington (whose adventures inspired us to take OUR canal boat where no canal boat has gone before) docked here. And on Earth Day in 2007, the first boat to cross the Atlantic on solar power docked here. The Swiss-built 42-foot catamaran Sun21 replaced her sails with a canopy of solar panels. Town residents include folks having fun with sustainable technologies, like Paul Mascaro, who lives aboard his specially refurbished catamaran (includes composting toilet). When Paul comes to town he doesn't want to have to dig around for an electrical outlet to plug in his personal technology. 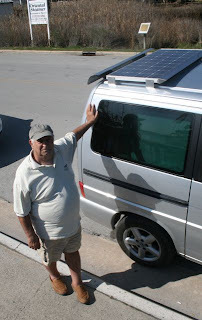 So his VW van sports a rooftop solar panel which nicely powers his MacBook. We also met Farron Peffer of Beta Marine, a UK-based marine engine manufacturer with a hot new offering for boaters, a hybrid system that combines a diesel engine with battery bank and electric motor. Looks remarkably like the Cap's home-made system, and marketed, in the UK, to canal boaters! 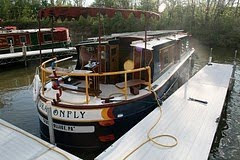 The system won the "Practical Boat Owner Green Award" in 2009. We noted earlier that the U.S. Military is moving toward adapting green technologies on a large scale. Local folks tell us the Marine Corps (at nearby Camp Lejeune) and the North Carolina Biofuels Center hope to partner with farmers to develop a local biofuels industry. Meanwhile our neighbor on the dock is a neat little steel-hulled sailboat with a diesel engine that runs on French fry grease from local restaurants. The skipper, a young guy named Martin, did the retrofit himself. He says, it works beautifully. Smells good, too.